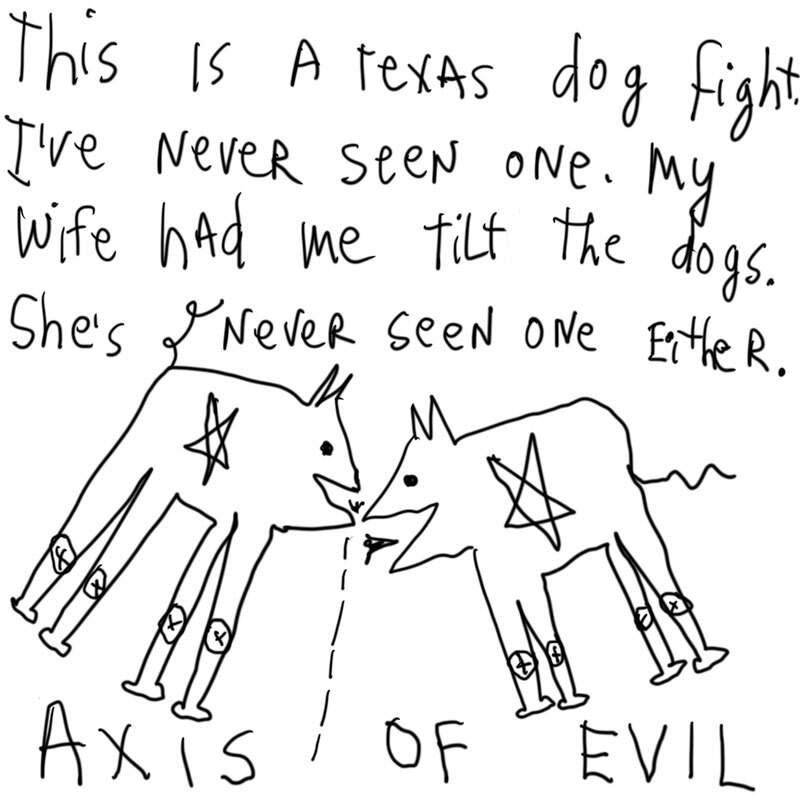 Diaristic Notations: Axis of evil? Certainly some human actions are terrible. I visited a torture museum in Italy where I saw depictions of horror upon horror (makes Dexter seem like Santa Claus). Worst was a picture of a community picnic, where on one side people were playing, and then, for entertainment, people on the other side were being tortured. Is this evil? It certainly was about sadistic pleasure. 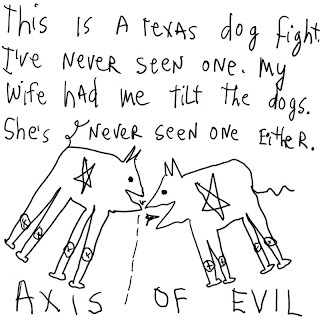 Is it worse than the dog fights in Texas? Is it worse than what goes on in the slaughter houses. Is it worse than the conditions many live in throughout the world today? Sometimes we do create evil through our actions. We are all somewhat destructive, I suppose, in subtle, or not so subtle, ways. Evil? That connotes to me that there is a connection to the devil. And since I don't buy into that mythology, I guess I don't quite buy into evil. Is it enough to say that some of our actions are mean and terrible, and leave it at that? I'm going to take the precept about not creating evil as not doing things that are mean and terrible. And before we give each other gold stars, I need to look at all my interactions, with other humans, animals, plants, and inanimate objects. Have I treated them with care and respect? Perhaps only then am I following this precept. I took a mythology class some time ago where I had to read Beowulf. At the time, I perceived that as evil torture. But the one thing that really stuck in my head about that story. . . Beowulf had to continue to fight evil at all times so that he would not become evil himself. Evil’s not just something you give up like smoking. . . It’s something one has to work against one’s entire life. Moreover, just because you don’t do evil doesn’t mean you’re off the hook. Because you still have a responsibility to FIGHT the evil around you. It’s so damn hard being human sometimes. I must say that I DO believe in "evil" and DO NOT believe in the devil. I have seen evil, first hand, in the action of sociopaths who delight in harming others because they can. I have seen very terrible things happen which I would not consider "evil," since there was no intent to harm. The damage was either accidental or in some way unintentional. I believe evil is a function of both intention and action to harm another for the sake of harming. No need for a devil or an angel or a god or anything short of a twisted human spirit that delights in hurting others. Just read "The Sociopath Next Door" to get a better understanding of what I consider "evil." Since you don't buy into the Christian mythology about good and evil, and you DO buy into the Buddhist mythology, that there isn't a good and evil, does it all boil down to just whose mythology that YOU DO buy into? Is everyone not entitled to believe in the mythology that suits them the best? Is saying the Buddhist way of thinking is the best and only truth, NO different than the Christian saying that his way is the ONLY WAY? By believing that your way is the best, are you not guilty of doing the same thing? Might each and every WAY be right in it's own way, for different people? Because YOU don't buy into it for yourself, does it make it so? And, are you qualified to say what is and what is not? If not, can you tell me beyond a doubt who is? Is everything not just speculation in the end, because until you actually die, you can't really be sure? Can you tell a Mother whose child was slaughtered, that such an act was not evil? If that act is not evil, can you tell me what it is?